What the 1982 paper did was make the case that the two streams in the macaque monkey were cortical, that the origin of them was the striate visual cortex. Important stuff, but as with almost all big ideas, it was built on a solid pre-existing foundation. In the auditory domain, Josef Rauschecker is often credited with originating the view that auditory cortex is subdivided into two processing streams, a dorsal “where” stream and a ventral “what” stream (Rauschecker, 1998; Rauschecker and Scott, 2009). However, the idea of dual auditory streams predates Rauschecker’s influential papers by several decades. Deutsch and Roll proposed separate “what” and “where” mechanisms for hearing in their 1976 report (Deutsch and Roll, 1976) citing then recent animal neurophysiological evidence for the distinction (Evans and Nelson, 1973). And a historical precedent to a dual-stream model of audition goes even farther back to the work of Poljak who in 1926 discussed the various subdivisions in “the connections of the acoustic nerve” and came to a conclusion that foreshadowed current dual-stream ideas by the better part of a century. We could, of course, go back even farther and point to Wernicke’s classic language/brain model, which held that the auditory system had two connections, one to the widely distributed conceptual system and the other to the motor speech system. Wernicke, as far as I can tell, proposed the original dual stream model of cortical processing. Deutsch, D., & Roll, P. L. (1976). Separate "what" and "where" decision mechanisms in processing a dichotic tonal sequence. J Exp Psychol Hum Percept Perform, 2, 23-29. Evans, E. F., & Nelson, P. G. (1973). On the relationship between the dorsal and ventral cochlear nucleus. Experimental Brain Research, 17, 428-442. Ingle, D. (1973). Two visual systems in the frog. Science, 181, 1053-1055. Poljak, S. (1926). The connections of the acoustic nerve. Journal of Anatomy, 60, 465-469. Rauschecker, J. P. (1998). Cortical processing of complex sounds. Current Opinion in Neurobiology, 8, 516-521. 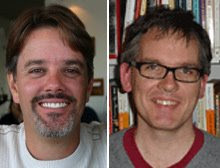 Rauschecker, J. P., & Scott, S. K. (2009). Maps and streams in the auditory cortex: nonhuman primates illuminate human speech processing. Nature Neuroscience, 12, 718-724. Ungerleider, L. G., & Mishkin, M. (1982). Two cortical visual systems. In D. J. Ingle, M. A. Goodale & R. J. W. Mansfield (Eds. ), Analysis of visual behavior (pp. 549-586). Cambridge, MA: MIT Press.